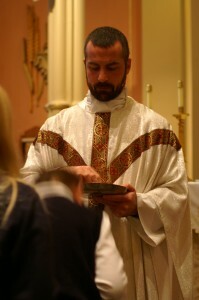 The whole Church is a priestly people. Through Baptism all the faithful share in the priesthood of Christ. This participation is called the “common priesthood of the faithful. Based on this common priesthood and ordered to its service, there exists another participation in the mission of Christ: the ministry conferred by the sacrament of Holy Orders, where the task is to serve in the name and in the person of Christ the Head in the midst of the community. The mission entrusted by Christ to his apostles continues in the Church until the end of time: thus it is the sacrament of apostolic ministry. It includes three degrees: the bishops, priests, and deacons. Religious Life includes those that embrace the spirituality, charism and teachings of the community’s founder. Members of these communities follow Jesus through taking vows of poverty, chastity and obedience. They grow in holiness through their gift of themselves to God and His people. Mother Maria Gratia Luking S.P. Sister Mary Clement Brennan, S.P. Sister Mary Lenore Brennan, S.P. Reverend Henry Peters (1853-1874) Deceased.